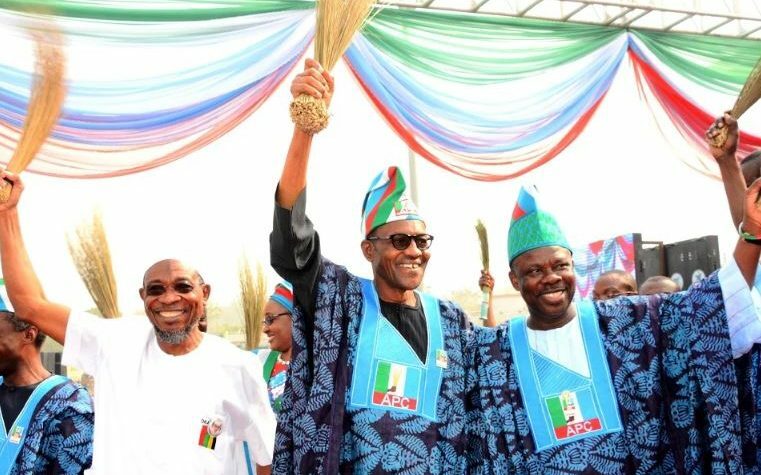 The All Progressives Congress (APC) Presidential rally in Abeokuta, Ogun State today has ended in violence among as various political parties at the MKO Abiola International Stadium, venue of the event clash. The National Chairman of APC, Adams Oshiomhole, who was not listed as a speaker at event, was booed and was stoned by some hoodlums. Newscastars.com also gathered that the former Lagos State Governor, Asiwaju Bola Tinubu equally left the stage while President Muhammadu Buhari, was addressing the hostile political gathering. However, trouble started when former Osun state governor, Rauf Aregbesola, in veiled response to Amosun’s speech, accused other parties supporters of “hanky-panky”. Apart from the factional APC led by Amosun and Chief Olusegun Osoba, a large number of Allied Peoples Movement (APM) led by the governorship candidate in the state who is the anointed candidate of Governor Amosun attended the rally. The victims were believed to be supporters of APC Governorship candidate, Dapo Abiodun who doesn’t have the backings of Amosun.